No time like the present to start our new series, Low, Slow and So Worth It! I'll be posting recipes that my family loves - because it's all about them. There's a new Low & Slow button in the sidebar where you'll be able to find main entrees, veggies and even some Low & Slow desserts. And, of course you can find us on Pinterest, Facebook, Twitter, and you can subscribe for free to have our posts send directly to your mailbox. For this Cider Braised Beef you can use whatever tough cut of beef is on sale at the butcher. 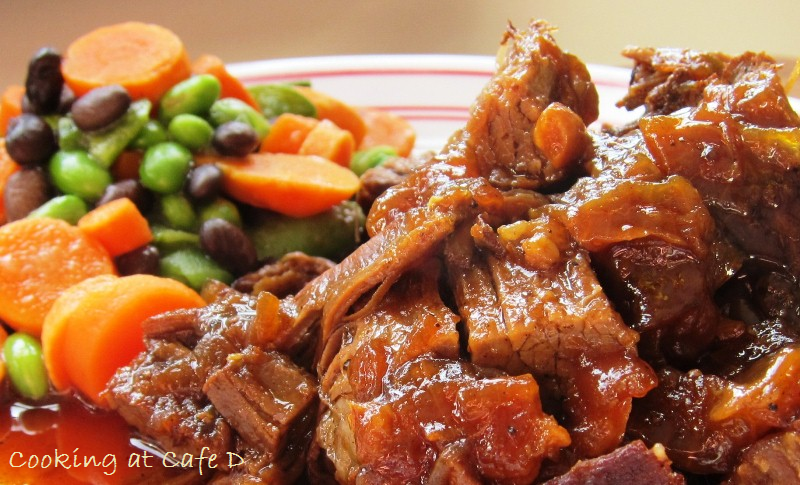 Brisket, round, chuck - anything called "stewing meat" are all good choices. Here we used brisket. While I wold have preferred to use cider, hello, it's January. So, I used apple juice concentrate - which is something I've used with success before. The beef is succulent with a hint of apple and onion. My husband almost licked the plate. And, he's NOT a big meat eater. Let the beef come to room temperature. Dry it with paper towel. (If you are cooking in a dutch oven, you may need to cut the beef into 3 or 4 sections and brown it in batches. If you are using a roasting pan, you can leave it as one piece.) Season liberally with salt and pepper. In a large dutch oven or roasting pan, heat vegetable oil and sear the meat until it is brown on all aides. Remove the meat - keeping the juices and oil in the pan. Add the onions and place the garlic on top of the onions. When onions are brown, deglaze the pan with the apple cider vinegar scraping the bits from the bottom. Remove the pan from the heat. Remove the onions and garlic. Place the beef back onto the dutch oven or roasting pan - try to get the pieces as flat as possible. Here, I add additional salt and pepper to the top of the beef. Pour the cider or apple juice and water on the side of the beef. Hold back to add so the liquid comes to 3/4 of the way up the side of the beef. Add bay leaves. Top with the onions and garlic. If you are using a roasting pan, cover with foil creating a tight seal. If you are using a dutch oven, put the lid on. Remove from heat and let the beef rest for 30 minutes. Carefully open the pot or foil and remove the beef. Slice the meat against the grain. If necessary, simmer and season the braising liquid. This brisket goes well with our Ginger Carrot Soup. Got leftovers? Make a super quick Beef Ragu.